Congratulations, Suzanne! Expect an email from me asking for your mailing address. Next week, I'll be featuring a review of TIME TRAVELING WITH A HAMSTER by Ross Welford, and the week after, an exclusive Q&A with Ross, and a giveaway! 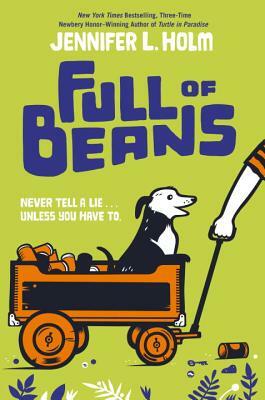 FULL OF BEANS by Jennifer L. Holm -- and a GIVEAWAY! Synopsis (from the publisher): Grown-ups lie. That’s one truth Beans knows for sure. He and his gang know how to spot a whopper a mile away, because they are the savviest bunch of barefoot conchs (that means “locals”) in all of Key West. Not that Beans really minds; it’s 1934, the middle of the Great Depression. With no jobs on the island, and no money anywhere, who can really blame the grown-ups for telling a few tales? Besides, Beans isn’t anyone’s fool. In fact, he has plans. Big plans. And the consequences might surprise even Beans himself. Why I recommend it: Well, first of all, I'm a sucker for any MG novel about The Great Depression, but especially when it's a marvelous mix of humorous and heartwarming. But also, to be honest, this is just plain fun. The kind of book that leaves you smiling when you turn the last page. Beans is a wise-cracking, lovable scamp of a character. If you've read Turtle in Paradise, this is actually a prequel, and leads right up to the beginning of Turtle in Paradise. But where the first book was Turtle's POV, Full of Beans is all about her cousin Beans Curry, and his various get-rich-quick schemes. Favorite lines: I felt like Daddy Warbucks. Giveaway details: Through the generosity of the publisher I have one hardcover copy to give away. To enter you must be a follower of this blog and you must comment on this post. This giveaway is open to US and Canadian mailing addresses only and will end at 10:00 pm EDT on Sunday Sept 25. Winner to be announced Monday Sept 26. Good luck!